@EliteSPA Yeah, there are a few things broken on the mobile site we're trying to fix over the next week or so. Sorry for the inconvenience. Is this a forum for mobile? The font size is HUGE on a 1080p monitor. It looks normal on 80% zoom. 1) Please have someone fix the behavior of CTRL+Arrow in the text edit boxes. Ctrl+Arrow shouldn't jump to beginning or end of a line, just word by word. 2) Can someone add (pretty please) the ability to do themes? The white/black color scheme was way too harsh for my eyes (and it seems, for others'), so I ended up adding an entry in Firefox's userContent.css file to do a quick fix, but I would rather not use the userContent trick. An option for a less "intense" color scheme would be nice (attaching screen cap of what I threw together in userContent, which, at least for me, is less hard on the eyes). The new forum was designed by the in-house Oculus design team, though I think there was some inspiration derived from modern social networks like Facebook and Twitter. When subscribing to threads the old forum would send a single mail when there was a new post and then it wouldn't send any more until you revisited the thread. I'm now getting a mail each time someone posts which is kind of a lot especially with busy threads like this one. Is there a way to make it work like it did before? Does it subscribe you to threads? I haven't received a single notification by email since it switched. And I can't see any way to tell if a thread is one I've commented in. I believe that's intended functionality, and I'm not sure I have the option to change it. However you can turn the emails off in your preferences and just receive in-forum notifications. You can also see on the top-right the star icon will show your bookmarked threads and how many posts are unread. On the plus side the links in the emails now take you directly to the thread (whereas before they'd just take you to the forum). The problem is there's just too many emails each day to make the notifications worthwhile. Ok, so you have to manually bookmark it, it doesn't automatically do it whenever you post in a thread like just about every other forum? @TwoHedWlf We have multiple options for notifications (including in threads you've posted in). Click the gear icon on the top right of the page and choose preferences to see your available options. How i can order the topics as creation date? I´m sorry, but this new update is not good. @ktoloco Sorry, I think it always shows most recent activity first. How do I mark all topics read. I always use that feature at forum so that I can se whats new since the last visit. Cybereality wrote: " There is also a "Dislike" button, which will eventually make the post hidden if enough people don't like it. This is a feature aimed at removing abusive or non-constructive posts from the feed. You should not use it if you simply disagree with someone." It seems there's quite a few people who haven't read this and treat the dislike button like on Youtube. Some people are disliking legitimate posts and hounding others simply because they have a pro Vive slant. What are you going to do about educating these people? I would create a thread about this but it's early days. Maybe a quick PM to the offending few Cyber? Yes, this is a problem. It is better when you only receive one notification per thread until you next visit the forum. It's made worse because I can't find any option to unsubscribe from a single thread. I really do want to get email notifications for any threads I've contributed to in the past, because that is important. But now I'm getting dozens or emails a day from this one thread so I'd really like the option to unsubscribe from it. Is there a way to change the "Dislike" to "Report" to avoid confusion? Out of interest, what does the Flag option do? Is that for personal reference if you want to look something up in the future? 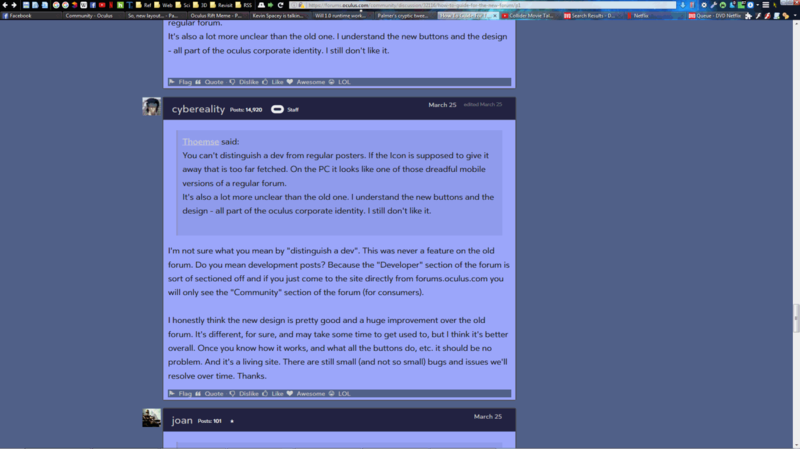 I see we can toggle lights when writing a post in full page mode. Please, please make this an option when in standard mode as well. All this white is killing my eyes. If you go to the Categories tab from the top menu, you'll see a list on Categories in the center. To the upper-right of each category element, there is a gear icon. Click this and choose "Mark Read". Unfortunately, I don't see a way to do it for the whole forum, so you'll have to "Mark Read" on each category. In addition, in the Discussions page, threads that have new or unread posts will appear with bold text and light background color. Threads that you have read or participated in with new posts will show a yellow bubble with the number of new posts since you last saw the thread. So, the Dislike is there for that reason as well. I was just pointing that out so people didn't abuse the feature. So far people have been good about it, and I'm personally OK as long as it doesn't get out of hand. So Flag is for really bad stuff. For example is Baba comes back and spams the forum, you should Flag it so I can remove it quickly. Or if someone is being racist or otherwise completely out of line. There is an options for "Spam" and "Abuse". This is basically the "Report" button you asked for. @cybereality Ahh nice! So we should think of the flag button as an instant report button and the dislike button as a collective report button! How do I quote someone who didn't post here? 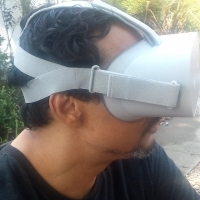 Earlier I tried to get it to show a Palmer Luckey quote as a quote, but couldn't figure it out. I tried [quote], [quote=blah], and [quote="blah"], none of them worked. I thought dislike was only for pro-Vive stuff? So if someone just says they are buying a Vive for legitimate reasons and is being friendly, then you don't have to do anything. If they are like "Vive Rulz, you guys suxors!11" then feel free to "Dislike". You didn't really say this. Just testing making a manual quote. 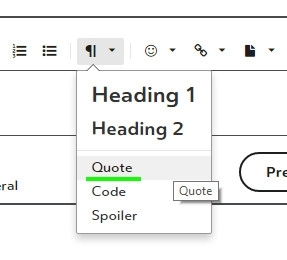 You can just press quote, do the "at" symbol and then write "said: ". Oh, I didn't know that paraphraph button had the option to choose Quote formatting, gottit. One thing to be aware of, when you make a manual quote, right something of your response first, then put the quote above it. Otherwise it's a little hard to make a new line (I'll look into this). How do I switch back to the mobile site on my phone? I'm still trying to figure that one out. Probably clearing cache/cookies on your browser would do it.